Yes, while everyone else in the world is starting to blog about Christmas, I am still catching up on Thanksgiving. To be honest, I took a little unintentional break from blogging. Nothing too exciting happened, nothing blog worthy that is. I was waiting to post until Thanksgiving anyway, because that is always blog worthy. The first round of Thanksgiving was on Thanksgiving day, November 28th this year. 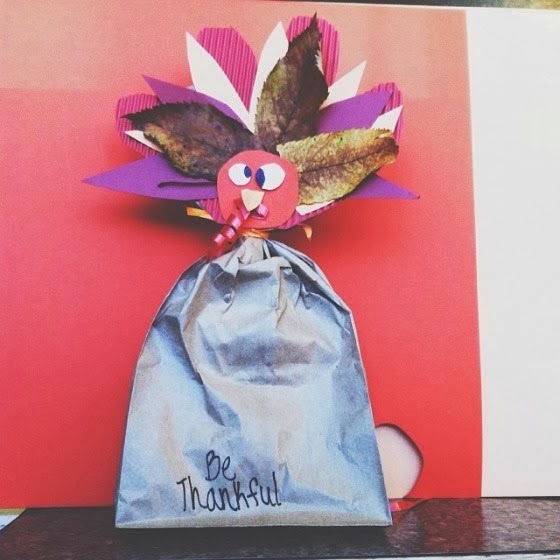 We woke up, cleaned the house, got ready for the day, and I made a turkey craft. In the morning, I was browsing Pinterest to see what I should make, and being a crafter who likes to make crafts to go with the holidays, I couldn't skip out on making a craft. I found inspiration from a paper bag and Fall leaves. 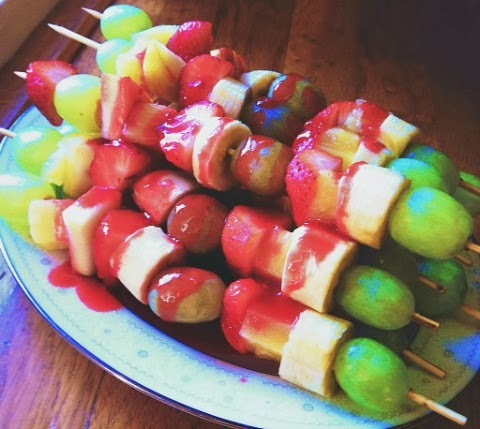 Instead of a fruit salad this year, I made fruit skewers. My mom helped me chop up all the fruit, and I slid them on skewers... which in some cases like mine, is more deadly than chopping up the fruit. I poked myself countless times sticking the fruit on the skewers. To go over the fruit skewers, I whisked up a red raspberry fruit sauce. It was delicious on the fruit skewers. For the meal, we had ham, yams, green bean casserole, the fruit skewers, stuffing, and mashed potatoes. What I mean by Thanksgiving Round 1 is Thanksgiving with my mom's side of the family. My Grandma & Grandpa Williams, My Great Grandpa Kirby, My aunt and uncle and cousins (but they didn't come til dessert). For dessert, we had a pumpkin cake. We were very into trivia that day. Since my family are I Love Lucy fanatics, we decided to bring out the I Love Lucy trivia game from the closet and quiz each other. We all did pretty good, but there some questions that were associated with things that didn't really matter in the shows... I guess they were details that stood out to the game makers and if you are a die-hard I Love Lucy fan, you should definitely know the details. Later, my aunt, my mom, my sister and I played a game called Scattagories. Scattagories is a game where there is a timer, an oddly shaped "dice" with twenty letters on it, you have a pad and pencil, and game cards that give you twelve things to think of, such as subject, TV star, sports figure, things you would find in a kitchen. So you roll the dice, and what ever letter it is rolled, you have to come up with things on the cards that start with that letter. It's a pretty fun game, and since there is a timer, the pressure is on. The next day was Thanksgiving Round 2, Thanksgiving with my dad's side of the family. When we arrived at my Grandma Biggs's house, my mom and I started helping Grandma with the dinner right away. 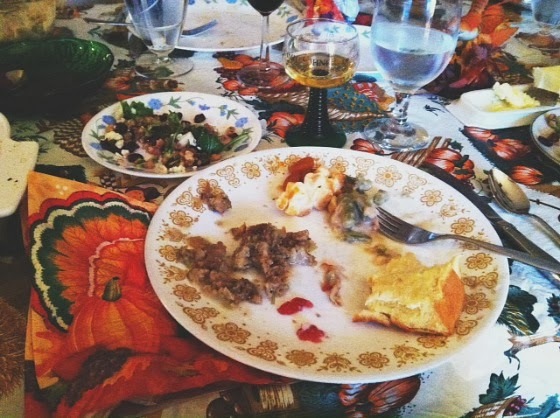 My sister and I filled the water glasses, and put out the little finger foods on the table, and I made the mashed potatoes and helped pour the gravy in my Grandma's antique gravy boat. When I brought out the stuffing, my grandma said that it was from the turkey. I asked her what was in it, and she said that I didn't want to know... so I left it at that. When my Aunt Aimee and Uncle Randy arrived, they brought their new, baby girl, Quincy. She is two months old, and she is so precious. 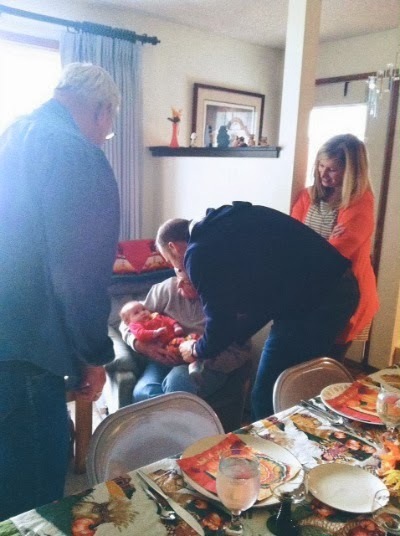 My Great-Grandparents were there too, and they had never seen Quincy before, so that was so special to witness them seeing the baby for the first time. Pretty soon, the table was set and it was time to eat. 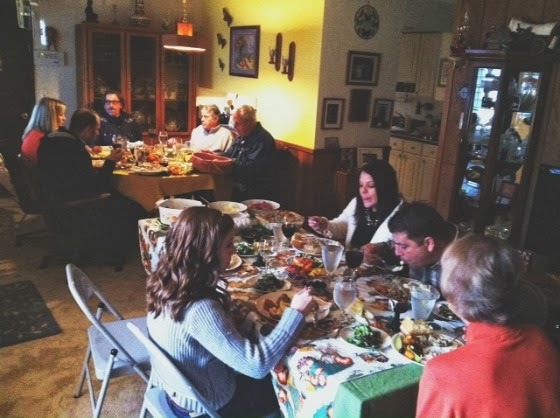 We all gathered around the tables and held hands, and Grandpa Biggs prayed for our meal. He said what he was thankful for, and it was very special. After the prayer, everyone was let loose to get their food. I waited till everyone was done, I like to make sure everybody has food before I help myself. For the meal, there was turkey, mashed potatoes, gravy, REAL stuffing, rolls, cranberry sauce (yum! ), yams, green bean casserole, and a salad with bleu cheese. It was a scrumptious meal. I was so excited about eating that I forgot to snap a picture before I scarfed everything down, so I took an "almost done" picture. After the meal, my mom, my sister, my grandma and me all helped clean up and clear off the tables. After we cleaned and tidied everything, we all sat around and talked. Aimee wanted to look through the baby books of my sister and me. She mentioned that we had a ton of hair when we were born, and how precious that was. I said I looked Native American when I was born, and Aimee agreed. After that, my grandma brought out her homemade pies! 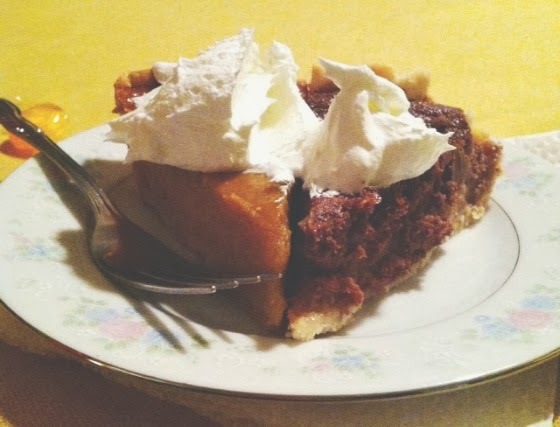 She made a pumpkin pie, and a chocolate brownie pie! Oh my goodness, they were amazing. The chocolate brownie pie was great! I suggested to my grandma that the next time she makes the chocolate brownie pie, to maybe sprinkle some mocha or coffee mix into the filling, because that would taste out of this world, but the chocolate brownie pie without the coffee was out of this world! The pumpkin pie was cold and perfect, especially with the cool whip on top. After dessert, my grandma took the whole family outside and grandpa turned on the Christmas lights. Everybody was quoting the movie, Christmas Vacation. When we went back inside, my dad suggested that the family play a game of Spades. I kept score and played on a new trivia app I found while Aimee, Randy, Brittney, mom, dad, and grandma played Spades. They played a few rounds and called it quits. We said goodbye to my grandparents and my aunt and uncle, and went home. This Thanksgiving will probably be the last Thanksgiving I spend with my family while I live in Oregon, because next year I will be living in Florida for college. I cherish my family and the memories that I have of them. It was a wonderful Thanksgiving. And now it's time for Christmas.